It had been a while since I read a book like this. On a forum somebody asked about ASH sources (Anglo-Saxon Heathenry) and somebody recommended this book. It is available cheaply second hand, so that was a good inducement to read something ‘heathen’ again. The persion inquiring about ASH sources might have had a book in mind solely about Anglo-Saxon heathenry. Owen continuously refers to Scandinavian heathenry. This is not unexpectedly, since however there certainly are Anglo-Saxon sources, the Eddas, etc. give a much more complete look at the world of Gods and spirits. 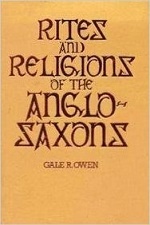 Rites And Religions does give a good idea about what is available for Anglo-Saxon souces though. The cross-references are needed to put things in perspective and to explain things that are not available in Anglo-Saxon sources. The most interesting chapter is the opening chapter “Gods and Legends”. It has quite a few images, quotes from tales and poems and general information about Gods and the like. A chapter about every day life is followed by a chapter about inhumation versus cremation. Both ways of disposing of the bodies of the deceased existed alongside eachother. The fourth chapter about ship burials starts interestingly, but soon becomes but an extremely detailed description of what was found where and when. Something similar happens in the chapter about “The Arrival of Christianity”. The chapter is overflooded with details about artifacts and the like. The last chapter about the Viking age has a few interesting points, but also here tends towards the very historic approach. The book is good to get a general idea of Anglo-Saxon history, but I did not alway found it a great read. I suppose it works well as something to read as starters on the subject.